Curious to know what our software can do? Try out AMS yourself, or discuss your polymer research challenges with us. Gain atomistic insights in the processes leading to failure in your polymers with ReaxFF simulations. Check out the advanced tutorial, or let us know if you want a demo on how ReaxFF can be used to model polymer formation, degradation and mechanical properties! 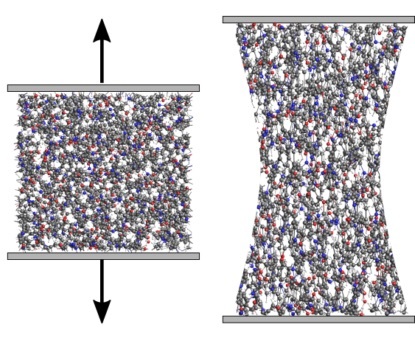 The recently implemented bond boost method by van Duin’s group allows you to model cross-linking of polymers, within reasonable time, following actual reaction dynamics with ReaxFF. 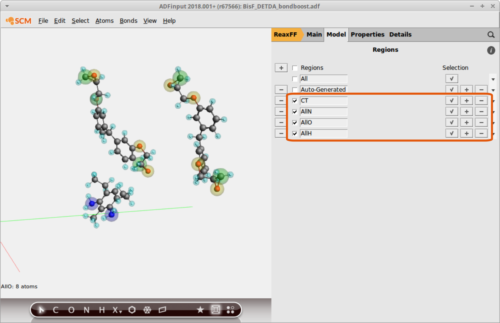 ADFGUI also allows you to build oligomers by adding your own monomers to the library and adding them together. You can then pre-optimize these with UFF, DFTB or MOPAC (see video). From on AMS2019, ADFGUI comes with a flexible polymer builder. See the tutorial for a demonstration on how to create a high-impact polysterene polymer (HIPS).